A heatwave may be enveloping southern Australia wrapping Melbourne, Hobart and Adelaide in unseasonable warmth, but don't get too used to it - we could be in for a wet and cool summer. The Bureau of Meteorology (BoM) has upped its prediction of a 'rare' form of the La Nina climate driver and has said the event is now almost certain to develop, with the effects of the weather event possible as soon as next month. In a climate note, the weather agency officially moved Australia to La Nina "alert" as it confirmed sea temperatures in the equatorial Pacific Ocean continued to cool, a key indicator it could be on its way. La Nina and its more well-known brother El Nino are the two ends of what's known as the El Nino Southern Oscillation or ENSO. This climatic cycle can have an impact on temperatures and rainfall in eastern and Northern Australia, as well as more extreme weather such as cyclones and droughts. "Oceanic indicators of ENSO show a clear progression towards La Nina. Tropical Pacific sea surface temperatures have cooled since late winter, and waters beneath the surface remain cooler than average in the eastern Pacific. However, they are currently just shy of La Nina thresholds," the Bureau said on Tuesday. "As a result, the ENSO Outlook has been raised to La Nina 'alert' meaning there is approximately a 70 percent chance - or triple the normal likelihood - of La Nina occurring." To back up its climate call, the Bureau released a graph that showed all eight of its meteorological models pointed to equatorial sea surface temperatures dropping to -0.8C below the average 1961 to 1991 levels - the Australian threshold for a La Nina. Seven of the eight models show a likely La Nina event, this is when sea temperatures remain across the threshold for at least three months. Australia could move into La Nina in December and stay there all summer until February. During a La Nina, while equatorial seas get cooler, the waters north of Australia warm up. That helps to produce rising air, clouds and rainfall over, particularly, Northern Australia but also in eastern and central parts. The chances of tropical cyclones and flooding can increase. Daytime temperatures can also drop during a La Nina. Conversely, longer duration, but less intense, heatwaves can be a feature. However, weather boffins are being circumspect about just how much of an effect an upcoming La Nina will have. If a La Nina is on the horizon, it usually makes its presence felt in Autumn or Winter. The BoM said the "rare" nature of a La Nina occurring in Summer meant its impact was hard to judge. "Climate models suggest that any [La Nina] event is likely to be weak and short-lived. 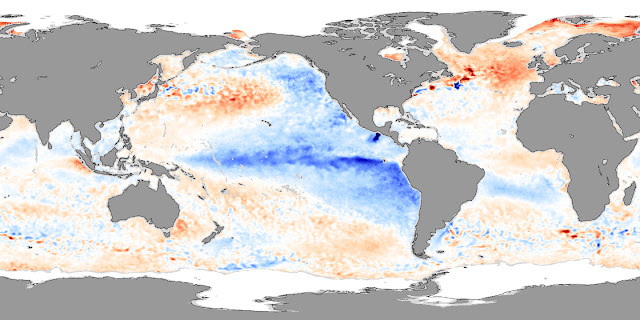 This means it is expected to be very different to the strong 2010-12 La Nina," the Bureau said. Sea temperatures around the country's north were not expected to warm significantly, it continued. At this point, the long-range weather outlook for Summer still suggests no strong push to either wetter or drier conditions. Indeed, the Bushfire and Natural Hazards Cooperative Research Centre (BNHCRC) has cautioned the increased likelihood of a La Nina does not mean fire hazards are lessened. In it's Southern Australia Seasonal Bushfire Outlook for Summer, released on Wednesday, the organisation said competing climate drivers from the Indian Ocean could pacify the extremes of La Nina. Dr Richard Thornton, CEO of the BNHCRC, said preparations still needed to be made for the fire season. "It is really important that people do not become complacent - despite being on La Nina alert, southern Australia will have a fire season, and we are in it right now," he said.